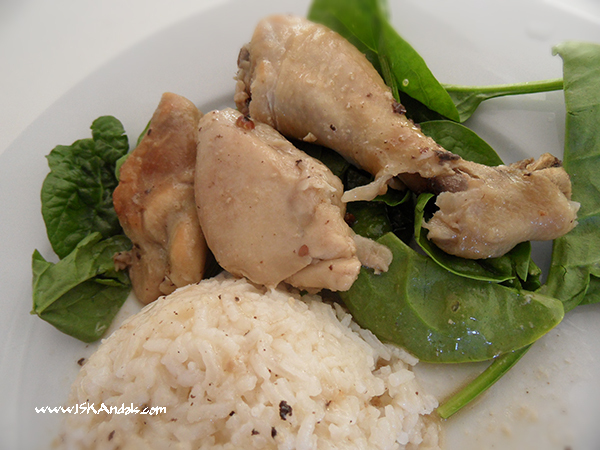 The blogosphere has been abuzz with adobong puti (white adobo) that I finally tried it. But baked – reason being more lazy than busy. Love the tender baked chicken with crispy skin and the sauce on rice is absolutely gorgeous. My son loves it though he says he still prefers the version with soy sauce. Looking back, I remember cooking a similar dish I learned from a colleague – calls it adobo sa labanos. Pork sautéed with sliced radish, vinegar, garlic, bay leaves, peppercorns and fish sauce; no soy sauce. Hmm, I’m not a newb after all. 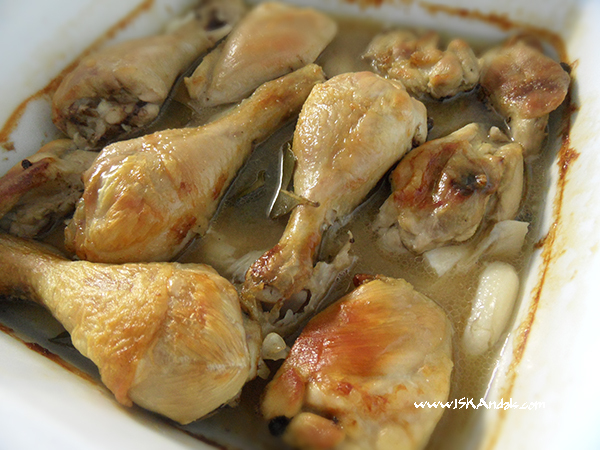 In a baking dish, marinate chicken with vinegar, salt, peppercorns, garlic and bay leaves for at least an hour. 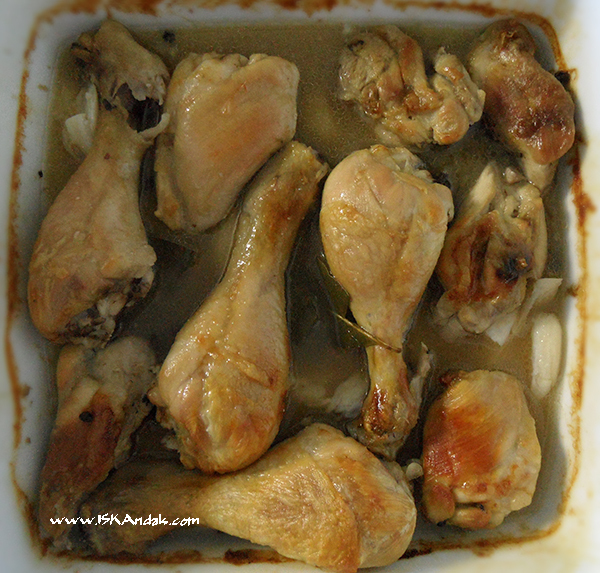 Preheat oven to 200 deg C.
Add a cup of chicken broth to the baking dish without stirring. Bake for 45 minutes, stirring once midway through cooking. Pour sauce into a saucepan and place baking dish back into the oven. Fangrill (or grill) at 180 deg C for about 5 minutes to brown the chicken a bit (this is optional). Meanwhile, heat the sauce on stovetop to reduce. Taste and adjust seasoning to balance saltiness with vinegar flavor according to your preference. Pour over cooked chicken and steamed rice. Marinating time not included in preparation time indicated. I have yet to try this version, but this looks really good! Always cool to learn something new. Great post! I love the brown parts on the chicken – I think that’ll give a nice contrast in texture. Oh by the way… I loved the look of the rice; did you add something to it (maybe used broth instead of water to cook it) or did you just pour sauce over it? Parang sticky rice ang dating kasi, sarap tignan. Just adobo sauce poured over rice Yummy! that looks delicious! i just love the different adobo varieties! i think i love them all…including the ones that are still going to be “made”. Haven’t tried White Adobo but I’ve heard about it already. Yours look so good! Might try to cook this one of these days. Thanks for the recipe! Kriska Marie recently posted Happy Birthday Gia!!! Ola Senorita! I can just imagine the sauce poured over rice. Yum!